KANSAS CITY, Kan.-- Several laptops are stolen from students at one KCK high school. "They have all of our phone numbers; They didn’t call and say 'Hey this has been stolen,'" Stormy Macdonald, whose son had his laptop stolen, said. 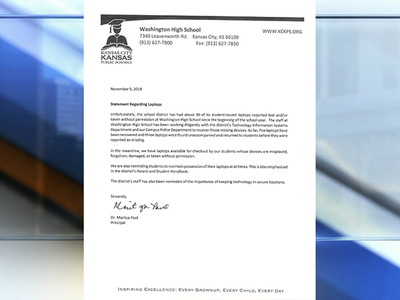 Macdonald is upset at the way the administration at Washington High School in KCK is handling her son's loss. On Monday, someone stole his laptop as he went into the athletic department to turn in his uniform. "When things get stolen, I call the police, I file a police report, and if I have homeowners insurance or whatever car insurance, I file it on a claim on my insurance. As far as I know, nothing like that has been done at the district level," Macdonald said. Macdonald says when her husband called the school's IT department, they were told they don't have the ability to track down the laptop. "That’s negligent to me. You should be able to track things that are electronic, especially in today’s world," Macdonald said. Among students at Washington H.S., it's no secret who the thieves are targeting. "They’re all athletes, they’re all people that play sports," said freshman Naelly Llamas. Other parents say this is ongoing issue. Seven laptops have been reported stolen or lost in the first nine days of November, according to Melissa Bedford Fears, a spokesperson for the KCK Public School District. According to district policy, a student has to pay $150 if a laptop is lost or stolen. "I’m sure schools have insurance instead of telling the kids you have to pay $150 dollars or do community service like they’re the criminals," Macdonald said. "It’s messed up and they need to turn it back in," Llamas said.